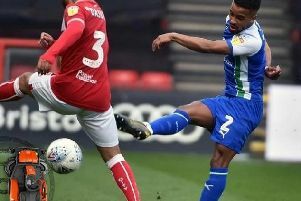 A man has been arrested and released under investigation as part of a police probe into a racist message sent to Wigan Athletic player Nathan Byrne on social media. Lancashire Police confirmed a 20-year-old man from Sheffield contacted them and handed himself in at Blackpool Police Station on Saturday (April 6). He was subsequently arrested on suspicion of a racially aggravated public order offence and malicious communications. He has now been released under investigation pending a decision whether to charge him or not by the Crown Prosecution Service (CPS). It is believed the message was sent by someone while in Lancashire. Police have updated both Byrne and Wigan Athletic on the latest developments. Defender Byrne had highlighted the abusive message he had received on his personal Twitter account after playing in Latics 2-2 draw with Bristol City at Ashton Gate. The club has publicly spoken of being "angered" by what has happened and immediately reported the matter to police over the weekend.